BROWARD COUNTY, FL -- Broward County&apos;s Port Everglades is moving forward with a plan to widen and deepen its channels, but there are still several steps to go before construction begins, the Port&apos;s Chief Executive Steven Cernak told elected officials and business leaders during an event to celebrate the project&apos;s long-awaited approval from the U.S. Army Corps of Engineers. In addition, Cernak announced that the Corps has committed $1.2 million for the immediate next step, which is the pre-construction engineering and design phase, estimated to cost a total of $5.6 million. "Our Congressional Delegation has taken our message to Capitol Hill with determination and perseverance, so that we can begin the design phase this fall and be ready for construction before receiving Congressional authorization," Cernak said. "It has been a long and winding road. But we are much closer to the finish line." Cernak and members of the local Congressional Delegation addressed the need for continued bipartisan support to receive Congressional authorization and funding to move the project forward. Members of Congress who spoke at the event included Debbie Wasserman Schultz (FL-23), Frederica Wilson (FL-24), and Lois Frankel (FL-22). "Today is a day to celebrate at Port Everglades. We know Florida is part of the increasingly interconnected global economy, one that requires us to act with one eye on South Florida, and one eye on the rest of the world, to stay ahead of the curve and ensure we are not falling behind. The Port&apos;s dredging project is vital to making South Florida a better place to work and raise our families," said Congresswoman Wasserman Schultz. "I am glad to see that Port Everglades and the Corps of Engineers have accepted the challenge to stay at the forefront of port development and work with environmentalists to continue our struggle to create Jobs! Jobs! Jobs!" said Congresswoman Frederica S. Wilson, founder of the Florida Ports Caucus, a bipartisan Congressional taskforce that coordinates federal action in support of Florida&apos;s harbors and waterways. Congresswoman Frankel said: "From every level of government and across the private sector - this has been a bipartisan, public-private effort to bring more good paying jobs to South Florida." Broward County Mayor Tim Ryan credited the grassroots efforts of the Port Everglades Association, the Greater Fort Lauderdale Alliance, Broward Workshop, the Greater Fort Lauderdale Chamber of Commerce, the Hollywood Chamber of Commerce and numerous other organizations for moving this project forward. 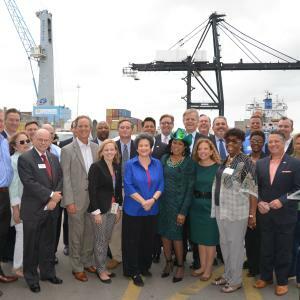 "Port Everglades is an economic powerhouse for Broward County, generating over $28 billion in economic activity and nearly $810 million in state and local taxes," Mayor Ryan said. "But what many people may not realize is that the Port is a self-funded enterprise that is supported by user fees as opposed to local taxes. It is, however, governed by the Broward County Board of County Commissioners. We are proud to serve the people and businesses who make the port a success for our community." Florida Representative George Moraitis; Christopher Roland, President of the International Longshoreman&apos;s Association Local #1526; and Eric Roth, Executive Vice President of Finance and Operations for Premier Beverage Incorporated also talked about how Port Everglades benefits the community through economic stability and job creation. As one of South Florida&apos;s leading economic powerhouses, Broward County&apos;s Port Everglades is the gateway for international trade and cruise vacations. Consistently ranked among the three busiest cruise ports in the world, Port Everglades is also one of the nation&apos;s leading container ports and South Florida&apos;s main seaport for receiving petroleum products including gasoline, jet fuel and alternative fuels. The Port Everglades Department is a self-supporting Enterprise Fund of Broward County, Florida government with operating revenues of approximately $153 million in Fiscal Year 2014 (October 1, 2013 through September 30, 2014). It does not rely on local tax dollars for operations. The total value of economic activity at Port Everglades is more than $28 billion. More than 224,000 Florida jobs are impacted by the Port, including 13,322 people who work for companies that provide direct services to Port Everglades. For more information on Port Everglades, go to porteverglades.net or e-mail PortEverglades@broward.org.